Action Pistol is a shooting sport with a timed and numerically scored course of fire. 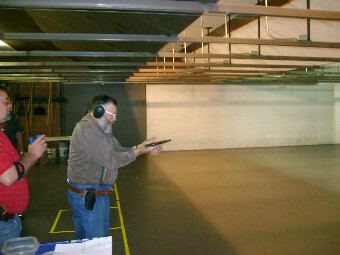 The members of SRC’s action pistol league provide a safe and friendly environment where members draw from holster, shoot multiple targets at varied distances, rapidly reload, and develop precision marksmanship in a timed atmosphere — all of these activities take place under strict range safety supervision. Range safety is of paramount importance in the action pistol division and all shooting is done under the careful supervision of a dedicated range safety officer. In order to participate in the league’s events, all shooters are expected to continually demonstrate knowledge and understanding of the firearm safety rules and safe gun handling skills. League: Each league is 10 weeks long and league competition scores are combined into an aggregate match score. SRC’s action pistol league wholeheartedly embraces new shooters, as well as those shooters that may be new to the sport of action pistol. The league members enjoy educating and mentoring every shooter in the skills necessary to compete at a high level and also have a good time. Equipment Requirements: Shooters may use any safe, serviceable handgun or revolver that is calibered in 9mm or larger. All handgun styles and calibers compete against each other — in this league, there are no separate competition divisions as there are in many other shooting competitions (IPSC, IDPA, etc). Holsters used during league events must completely cover the handgun’s trigger guard, be made specifically for the pistol being used, and designed to be worn outside the waistband (OWB). League Fees: The league fee is $20 per shooter for 10 week league session. The league session fee covers the targets and range equipment, with the remainder used to put on the end-of-league banquet. Spokane Rifle Club has a $5 indoor range fee that is paid by each shooter at each match. If you have questions or if you would like to join us for a match to see what Action Pistol is all about, please reach out to Action Pistol Division Chairman, Rob Wilson (contact info above). 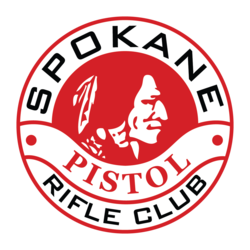 The Spokane Rifle Club bullseye pistol program sponsors one or more teams in the annual Inland Empire Rifle & Pistol Association winter league. Any Spokane Rifle Club member is eligible to join. Those new to bullseye pistol competition will be provided with appropriate instruction. The competition takes place on the indoor range using a 22LR pistol (semiautomatics are strongly preferred) using iron sights or optics. The league consists of ten National Match Courses of fire which are composed of (a) ten shots of slow fire, (b) two five-shot strings of timed fire and (c) two five-shot strings of rapid fire. The targets for the league are provided as part of the entry fee. 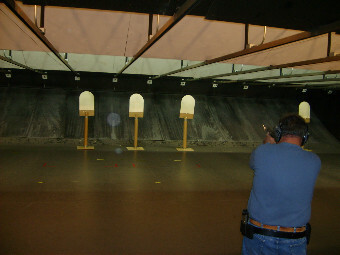 The bullseye pistol team fires on the indoor range on Monday evenings. We begin informal practice as soon as the indoor range is open in the Fall and generally distribute official league targets by the end of November. The first league targets are due in the first week of January, but it is permissible (and recommended) to fire targets ahead of the actual due date. The competition is NRA-approved and will result in the competitor earning an NRA competitive classification. The entry fee of $16 includes a $10 credit towards the end-of-season team dinner. Contact Jon Powell at powellacres@aol.com if you have any questions. You can also come by on a Monday evening between October and March and talk to the indoor range on-duty, volunteer Range Safety Officer to get more information.